- Six hours of pinyin reading lessons including some Chinese characters. 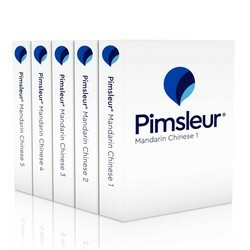 This Mandarin Chinese program includes all of Pimsleur’s Mandarin Chinese Levels 1-5. With this program you start from zero, first learning survival phrases and vocabulary, and eventually progressing to a mid-intermediate level of speaking and understanding Mandarin Chinese. Every lesson contains an introductory conversation, and isolated vocabulary and structures, as well as full practice for all vocabulary introduced. Emphasis is on pronunciation and comprehension. At the completion of this course, you’ll be able to speak comfortably about things that happened in the past and make plans for the future; you’ll speak confidently using your wide-ranging vocabulary, and experience the Mandarin Chinese language and culture with a deepening insight. Thre are twenty reading lessons for each level. In the first four levels, you’ll learn to read Hanyu Pinyin (pinyin for short) the official phonetic system for transcribing pronunciations of Chinese characters into a Latin alphabet. In Level 5, the reading lessons are designed to deepen your memory and understanding of learned vocabulary, as well as to begin the work of connecting the words and phrases that you have learned to hànzì, the characters used in the Chinese writing system.